I am willing to work in that way. If you are thinking of asking me to work for you directly, this site will give you guidance on what is involved. I have been in practice for over twenty years. 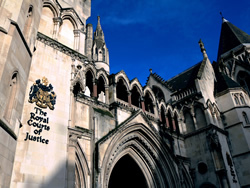 I have appeared in a number of significant cases (more details on the Lamb Chambers website). I am a member of a large and highly regarded chambers. I work quickly and efficiently. If I take on a case I will give you a time scale for the work I am doing and I will stick to it. My practice mainly involves litigation- people suing each other- though I can also assist with some non-contentious tasks such as drafting contracts or advising on how to protect copyright. Most of my experience is in relation to commercial, contractual and intellectual property and land disputes as well as solicitors' and other professionals' negligence and claims for personal injuries suffered in accidents or by food poisoning. I am qualified as a Californian attorney and accept instructions in matters with an Anglo-American element. What can you do when you are directly instructed? I am able to advise you about the strength of your case and how you should pursue it. I may do this in writing, over the telephone or most usually by meeting you face to face. I can draft documents for you to use in proceedings such as statements of case and witness statements. I can appear for you at court or in a mediation or arbitration. I may be able to negotiate with the other side for you. I can draft documents, such as standard contractual terms. In a suitable matter I can write a letter to your adversary setting out your claim or defence. What types of direct access work have you done? I have also accepted hundreds in dozens of first instance cases in the county court and High Court and some in other tribunals. Sometimes I have been able to provide useful advice with only an hour or soâ€™s work on simple matters. In the vast majority of cases I am able to give effective advice in a two hour conference. There are areas where I have no expertise, particularly crime and immigration and most types of taxation. If you do want to instruct someone in this type of matter I will try to recommend another barrister or solicitor who does have suitable expertise. Are there any other situations in which you will not be able to accept direct instructions? You can write to me at Lamb Chambers, Temple, London EC4Y 7AS or e-mail rc@lambchambers.co.uk. Telephone on 020 7797 8300 and my clerks (Paul, Mark and Cliff ) will put you straight through to me if I am available or arrange for me to call you back, which I will usually do within 24 hours. I live and mainly work in London, though I also have an association with Portsmouth Guildhall Chambers (02392 752400). In principle I am willing to work anywhere in England and Wales. However I normally charge for travelling time, and it could prove uneconomic to instruct me to appear in court a long way away. Of course for advisory work it makes little difference where the dispute occurred. Scottish and Northern Ireland have separate legal systems where I am not qualified. My fees will vary depending on the nature of the work and the amount in issue. I keep my hourly rates to well below half of that charged by litigation partners in the large City of London firms of solicitors while offering a service at least comparable to those they provide. My clerks or I will always quote either an hourly rate or fixed sum before taking on a piece of work. If I am asked to advise on a specific problem I will usually be able to give a definite figure in advance. For matters where the amount of time I spend will partly depend on factors beyond my control I may only be able to give an estimate. With many of my clients paying from their own pockets rather than a corporate budget I always provide clear and regular updates on the costs. Is it more cost effective to instruct you directly or through a solicitor? Because barristers' overheads are less than solicitors we can charge lower hourly rates than comparably experienced solicitors. Often much of the work that would be done by a solicitor, such as photo-copying and collating documents you will be able to do yourself. Some solicitors, particularly large firms, engage more than one person on a case as well as instructing a barrister, and clients pay unnecessarily for this duplication. Some people will prefer to have all the work, however mundane, done by a professional in which case they may be better off using a solicitor. Do we instruct you or your chambers? I work independently, not in partnership, and your contract will generally be with me alone. Members of chambers such as mine pool expenses and provide practical and professional assistance to each other. If I were, for instance, double booked I would normally suggest that someone from my chambers cover that work. The client would not have to agree to that but if they did they would enter into a separate agreement with the other barrister. Do you accept no win/no fee work? The Bar Standards Board has advised barristers not to accept work directly from the public on a no win/no fee (conditional fee) basis. Only in a case where I felt there was a compelling reason, such as very poor person who had a strong claim against a large corporation, would I depart from that advice. I have some sympathy for clients who spend a lot of money on legal fees and then run out, and in those cases I may well continue on this basis. Can I instruct you through an intermediary? Yes it is often helpful to have someone with legal experience such as a litigation support worker or retired solicitor assisting with cases. I will usually only contract with the client though. I will not accept instructions which involve dealing with a struck off solicitor. What if I am eligible for legal aid ? At the moment legal aid or public funding is not available for direct access to barristers, so if you hope to be funded that way you should approach a solicitor. Are you able to get any publicity for my claim? I expect many people will come to this site because of what I have written in the media, particularly the Guardian. I am happy to be approached for this reason, but it should be remembered you are approaching me as a lawyer not a journalist. I can not write about cases I have acted in professionally and I will not be able to use the threat of adverse publicity to obtain a result for my client. What other information might we need? The Bar Council has an informative website, which sets out what barristers and solicitors both do: http://www.barcouncil.org.uk .